Leah K. Tomaino allows her viewers to see the beauty of nature in our otherwise largely urban society. Thus, she uses her works as personal metaphors for her spirituality-conscious and direct affirmations of life after death, death after life, and life within death. Leah was educated at William Paterson University, The Studio School of the Aegean, and The Cooper Union. She is an adjunct professor at the County College of Morris, an art instructor at ARTWORKS STUDIO, and a Curator at The ARC. 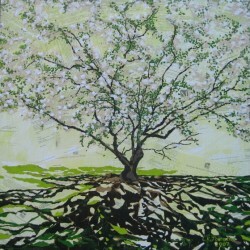 She is also a member of the National Association of Women Artists and the New York Artists Equity Association. Sept.1997-Jan.2002; William Paterson University, 300 Pompton Rd, Wayne, NJ. MA; 2002. June-August, 1987; The Studio Art School of the Aegean, Samos Greece. Sept., 1983-May, 1987; The Cooper Union, 42 Cooper Square, New York, NY. BFA; 1987. 2003-Present: Adjunct Professor, County College of Morris, 214 Center Grove Rd., Randolph, NJ 07869. Teaching 2-Dimensional Design, 3-Dimensional Design, Drawing I & Drawing II. 2001-Present: Art Instructor, ARTWORKS STUDIO,502 Millbrook Ave., Randolph, NJ 07869. Teaching Painting, Drawing, Collage & 3-Dimensional Art to students, Pre-K through Adult in various media. Coordinator of student exhibitions at the Randolph Township Municipal Building. Nov., 2010-Jan., 2011; “RECYCLED”,The County College of Morris Gallery, Randolph, NJ. Mar.-May, 2008; “ Days of Vines & Posies,” New Hope Sidetracks Art Gallery, New Hope, PA.
Oct., 2006-Jan., 2007; “Trees,” Collages & Paintings, Reform-Studio, Long Valley, NJ. June-August, 2005; “Trees,” Paintings & Drawings, The Madison Gallery, Morristown Memorial Hospital, Morristown, NJ. 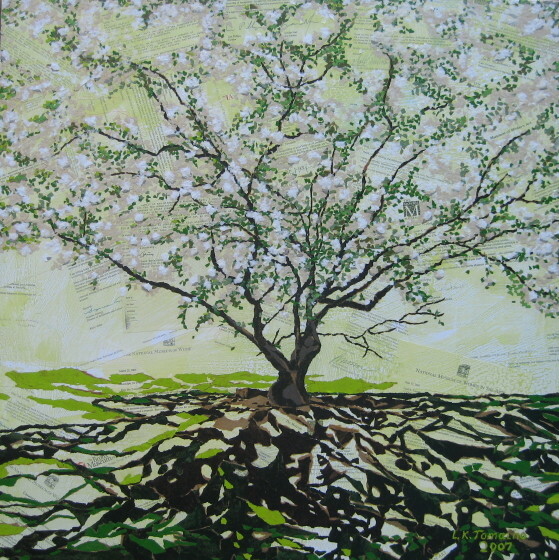 May, 2005; “Trees,” Paintings & Drawings, The Haggerty Education Center Gallery, The Frelinghuysen Arboretum, Morristown, NJ. 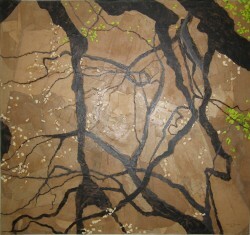 May-July, 2004; “Trees,” Paintings & Drawings, County College of Morris Gallery, Randolph, NJ. June-July 2003; “Trees,” Paintings & Drawings, Morris County Library, Whippany, NJ. 1994-2002; Numerous Solo Shows of Paintings, Collages & Drawings, The Atlantic Gallery, 40 Wooster St, New York, NY. April 1995; Paintings, Collages, The Randolph Township Free Public Library, Randolph, NJ. Apr., 2003; “World Arboreal,” The Clifton Arts Center, 900 Clifton Ave., Clifton, NJ. Exhibited with artist Nora Speyer. Feb.-Mar., 2002; “Trees,” Paintings and Drawings, The Atlantic Gallery, 40 Wooster St., 4th fl., New York, NY. Exhibited with artist Jane Henry. Sept.-Oct., 1998; Collages, Drawings, Photographs, The Atlantic Gallery, 40 Wooster St., 4th fl., New York, NY. Exhibited with Artist Jane Henry. July 1989; Assemblages, The West Wing Gallery, Ringwood State Park, Ringwood, NJ. Mar-Apr, 2009; “Reilly, Spatz and Tomaino,” ART UPSTAIRS, Mayo Center for the Performing Arts, 100 South St., Morristown, NJ. Sept-Oct, 2008; “Naked in New Hope,” Sidetracks Art Gallery, 2A Stockton Ave., New Hope, PA.
Sept-Oct, 2008; “Fall Collection,” The F.U.E.L. Collection, 249 Arch St., Philadelphia, PA.
May-June, 2008; “Convergence,” UP Front Exhibition Space, 31 Jersey Ave., Port Jervis, NY. Sept-Oct, 2007; “Naked in New Hope,” Sidetracks Art Gallery, 2A Stockton Ave., New Hope, PA.
Sept-Oct, 2007; “Desiderium,” Gallery Aferro, 73 Market St., Newark, NJ. Apr.-May, 2007; Geraldine R. Dodge Foundation Exhibition Space, Fairleigh Dickinson University, Madison, NJ. Feb-April, 2007; “Ménage Au Tree,” Sidetracks Art Gallery, 2A Stockton Ave., New Hope, PA.
Feb-March 2007, “21 st Annual International Juried Show,” Visual Arts Center of New Jersey, Summit, NJ. Juror: Laura Hoptman, Museum of Contemporary Art, NY, NY. June, 2006; Salmagundi Club, “Annual Juried Exhibition of Paintings, Graphics & Sculpture by Non-Members,” 47 5th Ave., NY, NY 10003. Nov.-Dec., 2005; Myhelan Cultural Arts Alliance, Inc., Long Valley, NJ. Exhibited with artists Patrick Dougherty and Todd Doney. Jan.-Feb., 2005; Griffin Gallery, “Naturescapes,” 2 Green Village Rd., Madison, NJ. Dec.-Jan., 2005; Broome Street Gallery, “Holiday Invitational Exhibition,” 498 Broome St., NYC. 1993-2002; 30 Invitational Exhibitions, The Atlantic Gallery, 40 Wooster St., New York, NY. May-June 1999; “CWOW in SoHo,” ‘Exhibit A’ Gallery, 160 Mercer St., New York, NY. May-June 1997; “Art of Northeast USA, 48th Annual Exhibition,” Silvermine Guild Arts Center, New Canaan, CT. Juror: Cora Rosevear. Dec.,1996-Jan., 1997; “The Broome Street Gallery Holiday Invitational Exhibition,” The Broome Street Gallery, 498 Broome St., New York, NY. Feb.-Apr. 1995; New Work Corner, City Without Walls, Newark, NJ. June 1993;“National ’93 Small Works Exhibition,” Arts Council Gallery, Cobleskill, NY. Juror: Ann Philbin. Feb,1996; GRANT, The Adolph and Esther Gottlieb Foundation, Inc., 380 Broadway, NY, NY. Artworld Digest, Seed Issue 2007; NY, NY, David Cohen, page 10. Mr. & Mrs. Whitney & Nancy Balliett; Mr. & Mrs. Michael & Camile Battaglia; Mr. & Mrs. Steve & Margaret Beecher; Mr. & Mrs. Ed & Doloris Bilinkas; Mrs. Sally Brody; Mrs.Muriel Brown; Mr. Lawrence Carter; Mr. John Malkowski; Mrs. Edith Cefaloni; Ms. Laura Coolack; Mr. Karl Dardick; Mr. & Mrs. George & Kathleen Debony; The Dover Municipal Building, Dover, NJ; Mr. & Mrs. Richard & Janice Fisch; Ms. Mary Granito; Spears & Meagan Griffin; Roberta Haag; Mr. Steve Heien; Ms. Jane Henry; Ms. Lisa Hurckes; Mr. & Mrs. Muong Sook Lee; Ms. Adrienne Lombardi; Mr. Kenneth Metzner; Polizzotto & Polizzotto, Brooklyn, NY; Mr. & Mrs. Robert & Anne Prebor; Mr. & Mrs. Robert & Kate Rabinowitz; Ms. Molly Rabinowitz; The Randolph Township Free Public Library; Mr. & Mrs. Michael & Mary Lou Scalera; Mr. & Mrs. Richard & Rose Schackner; Mr. Fred Simon; Magdalena Teter, PH.D.; Ms. Theresa Valvano; Mr. & Mrs. Tom & Marie Waldron; Mr. & Mrs. James & BethWelch; Mr. & Mrs. Jeff & Lisa Whelin. 1996-Present, New York Artists Equity Association, Inc., 498 Broome St., New York, NY. 1993-2002, The Atlantic Gallery, 40 Wooster St., New York, NY; 1995-1998 Vice President.